Greetings unto the list heralds and list runners of the East from Lucien de Wyntere, Troubadour Herald of our fair and glorious Kingdom. Our most noble Basilissa and Basileus are holding Their Armored Champions tournament at Sommer Draw in the lands of Bergental. If you wish to assist in heralding the lists or list running please reach to me at troubadour@eastkingdom.org. This is a great time for those new to running and heralding to try it out. Thank you in advance! Today saw the armored and rapier combatants of the East, Middle and Allies take to the filed in the epic confrontation that is the field battle. The armored fighters fought a best of five scenario with the East taking three of the five. The rapier fighters engaged in a best of three scenario with the Middle Kingdom and allies taking all three battles. Their Majesties knighted Ivan Valfrekr Hroereksson and Wilham de Broc on the battlefield. 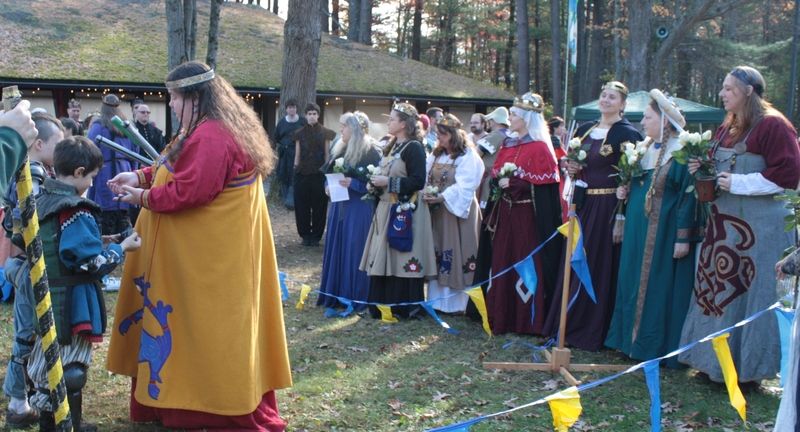 Following the rapier field battle They inducted Robert Earlson and Sorcha Dochair into the Order of the Silver Rapier. Several Eastern fencers took the field this afternoon dressed as super heroes. There will be an interkingdom practice in Shire Eisental on Sunday, February 10, 2013. This is both armored combat and rapier. Fighters and fencers from the East Kingdom and Kingdom AEthelmearc will be hosted at an indoor site. If you are free that weekend please consider heading out for some sparring. The location is the Community Fire Company No. 1, Schnecksville, PA, in the pavilion building.